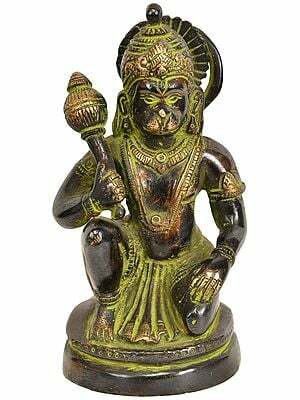 Hanuman, the widely-popular Hindu God, looks like a monkey He is revered as the embodiment of resourcefulness, devotion, elocutionary skills, cunning intelligence, and ascetic powers. 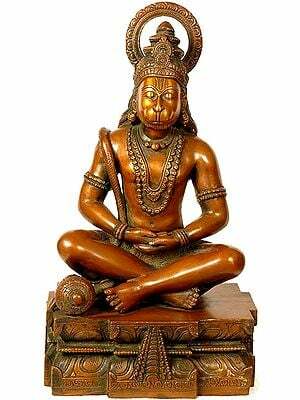 Shrines honoring Hanuman are foundacross the length and breadth of India. 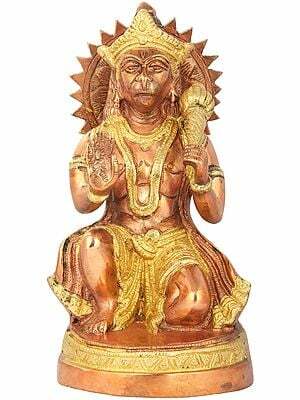 We often see statues of Hanuman, in an attitude of meekness and hushed awe. 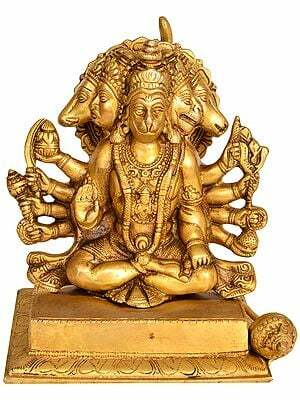 It is this attitude which overtakes him whenever he finds himself in the presence of Rama, his lord. 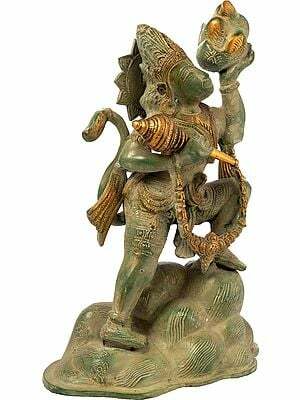 Often to express this feeling of veneration, the sculptures show his right hand raised in the direction of his nose and mouth-as if to insure that his unworthy breath may not taint the unsullied purity of Him before whom he stands. The upward-pointing gesture also suggests the supremacy of the Other while, in contrast, his left hand is dropped to mark his own lower status in the creaturely order of existence. 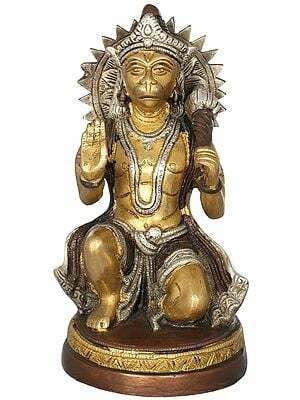 The tail, as in most delineations of Hanuman which express this attitude of humility, falls deferentially behind him. 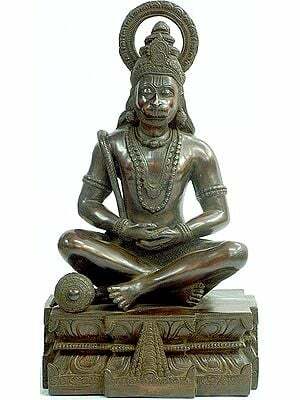 Artworks very often show Hanuman in a dhoti, pulled up above his knees to indicate his readiness for an active role upon demand. 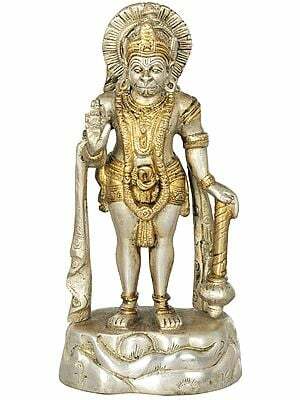 Over all, he wears a number of decorations-anklets, waistband, bracelets and biceps ornaments, necklaces, earrings and a crown. Often there is also a pearl necklace at his throat. 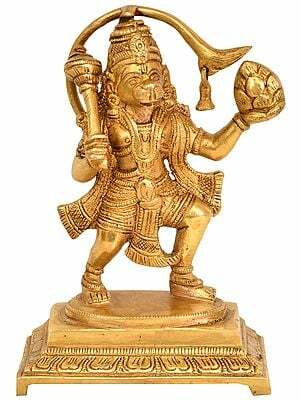 It was given to him by Sita immediately after Rama's coronation as a token of her appreciation of Hanuman's extraordinary qualifies of head and heart. 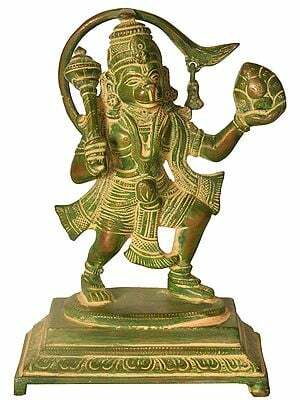 His flowing mane symbolizes his supernatural strength, on the one hand, while the urdhva-pundra mark on his forehead, on the other hand, stands in evidence that his powers are subservient to Vishnu (i.e., Rama in his original form). 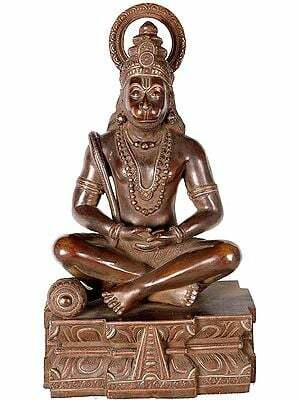 The upavita-cord which crosses his rugged torso is a trace of the brahmanical imprint given to his essential, untamed character, which influence has indeed graced him with remarkable endowments in leaning, subtlety, virtuosity, and eloquence [adhiti/bodha/acarana/pracara]. 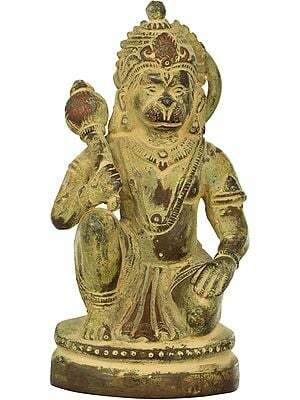 A variety of other depictions in Hindu Art of Hanuman in a standing [sthanaka] posture may be noted briefly. 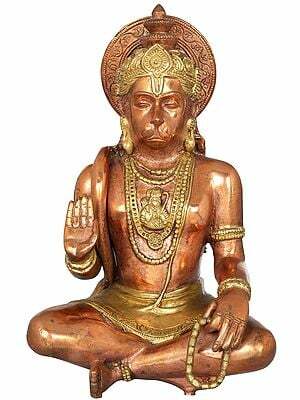 Sometimes he is shown with the position of his left hand slightly elevated. Thus, it may be raised palm-upward, either toward the elbow of the hand halting his breath, in order to give it support, or extended outward, in mute request to his Lord for instructions. 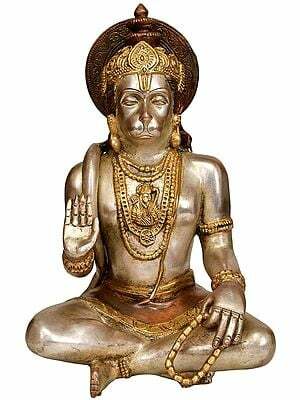 More often, both hands are raised and joined in anjali-hasta, a sign of respect; or, in an iconographically equivalent gesture, both arms may be folded with palms tucked respectively under opposite forearms. 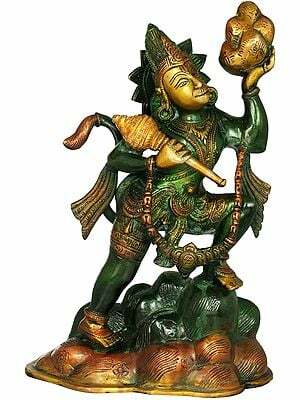 A more heroic stance is the not uncommon one which shows him standing with legs braced evenly apart [samapadasthanaka], his two hands ripping open his breast to reveal within his heart the presence of Rama, or of Rama and Sita together. 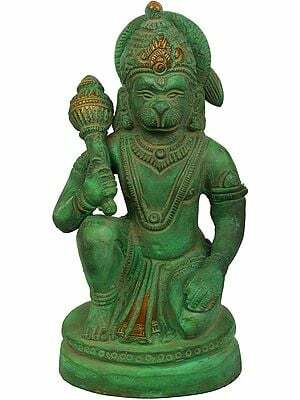 In such renditions, Hanuman's face displays an expression of exquisite joy; his tail will be erect and bristling; he may or may not be shown with a gada-club propped by his side. 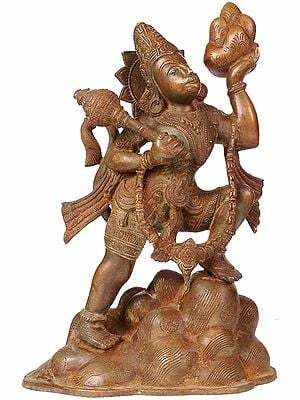 A very popular portrayal of Hanuman in sculpture shows him with his legs in a running or jumping position [alidhapada], one or both arms carrying the mountain of healing herbs. His tail will invariably be shown raised in vigorous affirmation of his heroic deed. 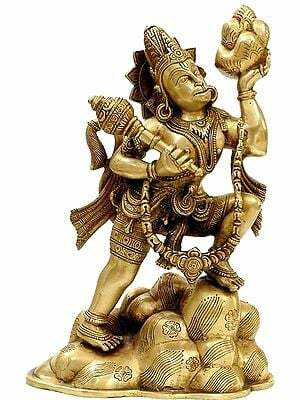 Hanuman is also depicted kneeling with one leg bent to the ground-sometimes that will be his left knee, sometimes his right-his hands held either in the anjali-hasta or outstretched with palms upraised. 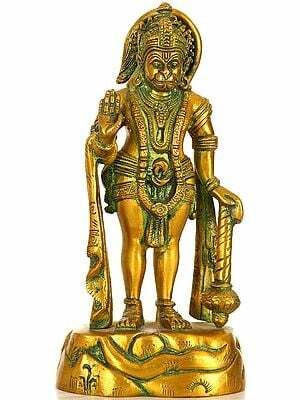 That latter position is the one regularly used when Hanuman's likeness is fashioned to serve as an oversized vahana-carrier for the Lord's image when it is taken in festive procession around the temple. In that likeness his tail will be shown elevated, while in the other postures it will be shown touching the ground. Seated Hanumans are found, too. 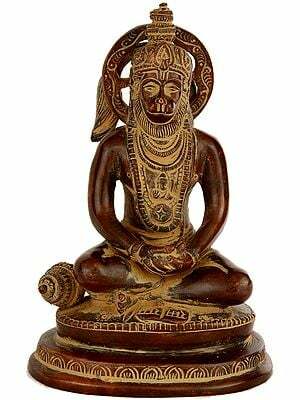 In that posture he is shown to demonstrate his expertise as a yogin, his many siddhi-powers-about which, more later-only suggested by the powerful contours of his body. 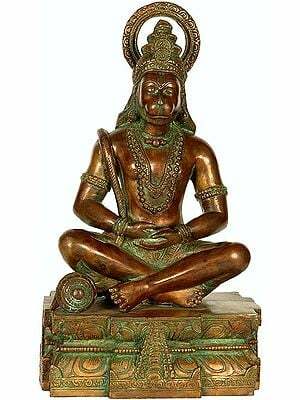 Legs crossed, tail in repose, gada-club set aside, hands folded in dhyanamudra, eyes lowered-he presents the perfect picture of the accomplished spiritual master who has utterly subordinated his animal instincts. 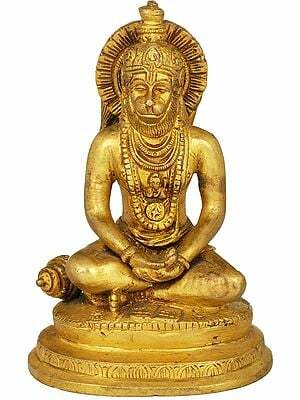 This view of Hanuman (which may or may not be reinforced by the presence of a yogapatta-band surrounding his body at the knees) affords an instructive glimpse of an influential facet of his personality. 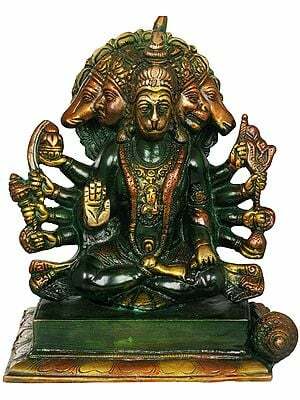 Occasionally to be found are five-headed depictions of Hanuman [panchamukha-hanuman], the four additional heads representing Garuda, Varaha, Asva and Simha-an impressive theriomorphic presence, indeed. 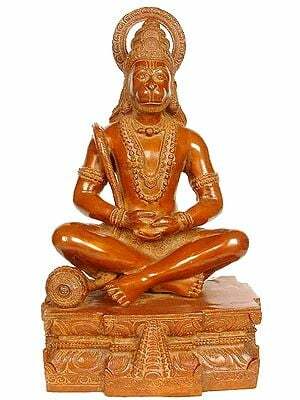 The name "Hanuman" means "one with swollen cheeks," and evidently refers to his simian countenance, although a common story attributes his name to a broken jaw suffered during infancy as the unhappy consequence of a daring and wondrous act. 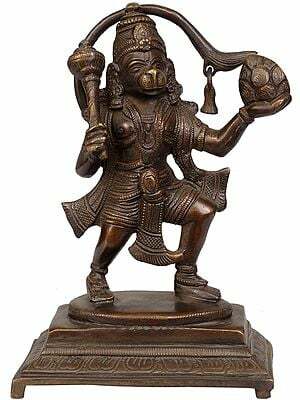 Another popular name by which he is known, "Anjaneya," identifies him as the son of the beautiful nymph, Anjana. 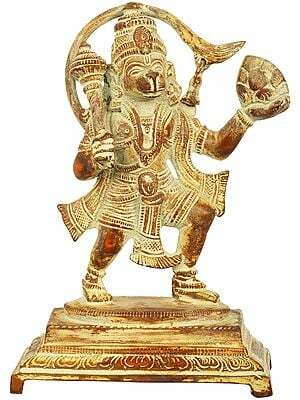 Two other well-known names are actually patronymics, both referring to the wind-god as his father-"Maruti" and "Vayuputra" (variants:"Pavanaputra," "Pavani"). 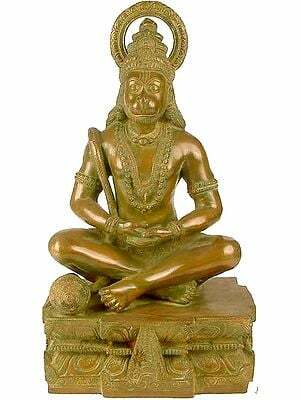 Yet another name by which he is known is an epithet for his willingness to attend upon Rama as servant, "Ramadasa." 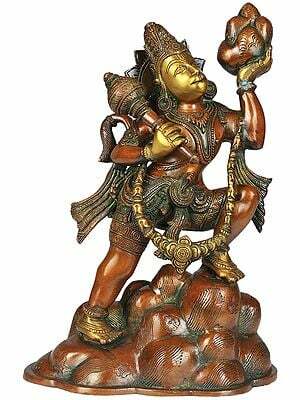 In north India he is known as "Bajrang Bali" (a corruption of Vajranga bali), meaning "the strong one with an adamantine body". 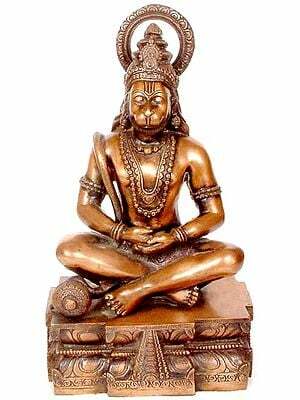 The domestic worship of Hanuman is characterized by devotion 'in home shrines to his image either in three-dimensional shape or in two- dimensional framed pictures of him. 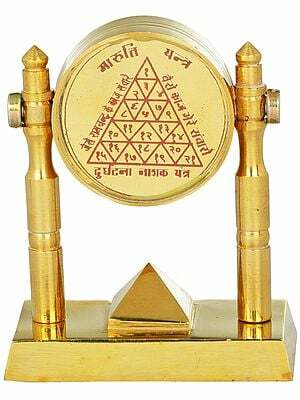 Some worship him in their private puja-rooms as chief, chosen deity [istadevata], some as one among others [samanyadevata], to whom it is their privilege to give daily honors. 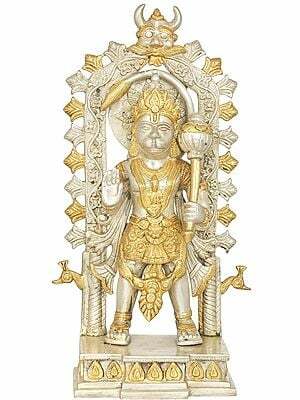 His portrait is, moreover, stamped on medallions, and these are often given to children as a talisman against evil spirits- though they may also be worn by adults for whatever blessings Hanuman may be pleased to grant. 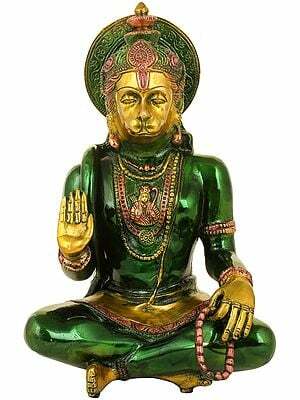 His presence is petitioned at times when crisis threatens, and countless children in the South are taught at an early age at least one invocation to Hanuman so that they may use it as needed-for examples, when tenor wakes them in the dark from the clutches of a nightmare they will have a memorized litany to recite, or when they have to walk alone through a threatening area there is a formula to mutter. 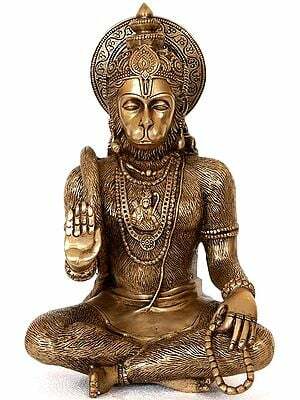 Adults, too, resort to invocations to Hanuman, though in more sophisticated accents. 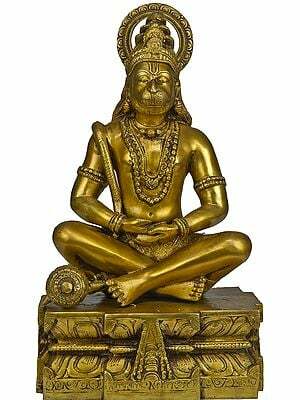 In addition to japa ("repetition") of his or of Rama's name, it is known that Hanuman will be present whenever the Ramayana ("the story of Rama") is read, and most surely when that portion of the story describing his exploits is featured. 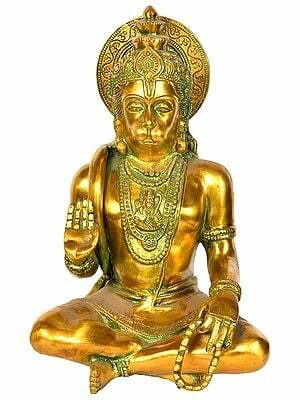 Hence,' adults at home are often observed giving much time to the reading of the "Sundara-kanda" portion of the epic, going over it again and again in the firm conviction that by keeping company thus with Hanuman good fortune will come their way.